I was back in Austin this weekend and didn't have a lot of time to write so I am keeping it a bit simple this Monday morning. I am a big fan of flavored oils and sauces, but for some reason I do not make them often. Perhaps it is because they are usually made for specific purposes, and once they have been used for that purpose I am never sure what to do with what is left over. Which, in the writing of it here, makes me realize how stupid a reason that is, given how delicious any flavored oil would be over any steamed, sauteed, or roasted vegetable, casserole, soup or stew. I found a recipe I wanted to try that called for cilantro oil and decided to make it. It turned out to be delicious, and finished off the dish perfectly. Like the gremolata, it melts into the hot food and adds a punch of fresh grassy flavor to every bite. 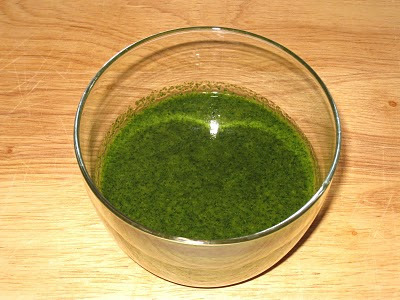 Place oil and cilantro in blender and puree until well blended. Can be made with a stick-blender.